We've put together a gold ETFs list so you can take advantage of the lowest gold prices since February. Gold ETFs give investors all the benefits of the gold market with much less risk than possessing physical gold. Gold ETFs are diverse, too. Some reflect the overall price of the metal, while some give you exposure to the gold market through gold mining companies. Even though gold prices have dropped recently, gold stocks have still been some of the best market performers of 2016. Here is why now is a great time to buy gold, and a list of our top gold ETFs of 2016. Why Invest in Gold Now? Gold is always a safe-haven investment from market volatility, but it can be a solid growth investment, too. Gold is up over 12% in 2016, while the S&P 500 is only up 7.9% and the Dow is up 9.7%. Even though the Dow shattered record highs this month, gold is still performing better on the year. Besides gold's current price performance, there is growing concern about a potential stock market crash. If the stock market crashes or falls substantially, gold prices are set to rise as investors seek a more stable alternative to stocks. With gold prices dipping and the possibility of a stock market crash on the horizon, now is a great time to buy gold. And with gold ETFs, buying gold has never been easier. Here are six of the top gold ETFs of the year that could still have room to grow. If you've been wanting to invest in growing gold mining stocks but couldn't decide on a particular mining company, this could be the ideal gold ETF for you. ALPS ETF Trust Sprott Junior Gold Miners ETF (NYSE Arca: SGDJ) is based on an index of junior to intermediate gold mining companies. The ETF is designed to favor both growth in revenue and price momentum in the stocks it holds. This is still a fairly new fund, launched in March 2016, but it is spearheaded by Sprott, which has previous success in gold ETFs and has another gold ETF on our list. You can pick up shares of SGDJ for $33.40, which are up over 75% YTD. The Global X Gold Explorers ETF (NYSE Arca: GOEX) invests in a range of companies involved in the exploration of new gold deposits around the globe. This unique gold ETF has been operating since November 2010, and there are currently over 2 million shares outstanding. While gold exploration stocks might carry more risk than typical mining companies, there is also the potential for significant upside. A well-run fund that is diversified can minimize some of this risk, and GOEX is an excellent choice. Shares of GOEX are trading at $29.17, with gains of 77.14% YTD. 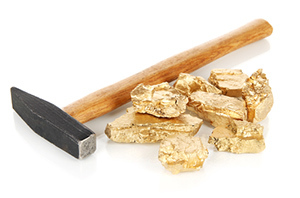 If you're interested in investing in small- to medium-cap gold mining companies, the VanEck Vectors Junior Gold Miners ETF (NYSE Arca: GDXJ) might be the right choice. This fund only invests in junior companies that invest primarily in gold or get 50% or more of their revenue from gold mining. The fund has been active since 2009 and has a market cap of $9.5 billion. Currently, GDXJ has 47 holdings that include companies like Pretium Resources Inc. (NYSE: PVG), a North American gold mining company with new mines opening soon. Shares of GDXJ are trading at $35.19, with gains of 83.71% YTD.